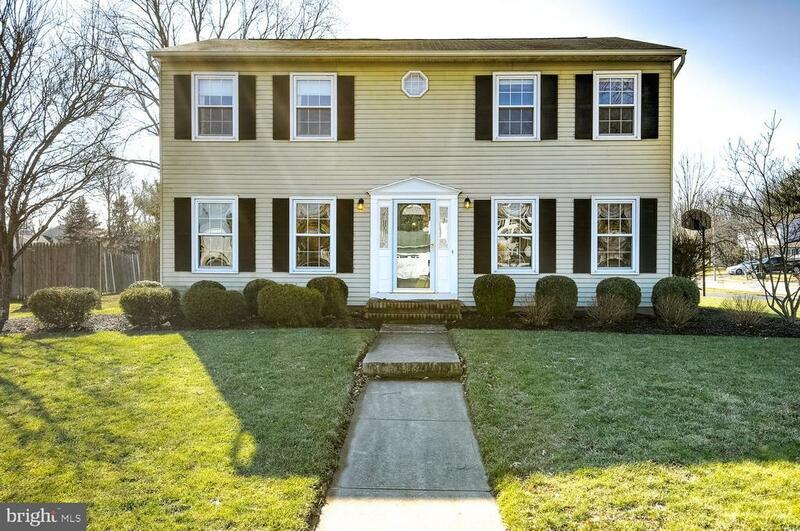 NORTHEAST FACING, EXPANDED & BEAUTIFULLY UPDATED, THIS 5 BEDROOM HOME WITH FINISHED BASEMENT IS TRULY MOVE-IN READY! A sunlit Foyer welcomes you to the Elegant Dining Room on one side and the Spacious Living Room on the other which leads to the warm Family Room with Full Brick Fireplace and sliding doors that open to a patio and private back yard. The KITCHEN HAS BEEN COMPLETELY REDONE with 42" Maple Cabinets, Stainless Appliances, Granite Counters & Tile Backslash. A Remodeled Powder Bathroom and attached two car garage complete the first floor. The second floor offers a Master Bedroom with 2 walk-in closets and en-suite Master Bath and Four Additional Bedrooms, since the home was beautifully expanded by the current owners. There is also a finished basement with plenty of additional storage space. Close to shopping, entertainment, public transportation and major roads, this Move-in Ready home is perfect for Living, Entertaining and Raising a family! Directions: Route 1 to Scudders Mill Rd or Ridge Rd to Schalks Crossing Rd to Parker Rd. Inclusions: Stove, Refrig, microwave, and dishwasher. Washer & Dryer "as is".